It’s a special time of year for tropicalistas! This week, Cinema Tropical – in partnership with the Museum of the Moving Image—is thrilled to present five special screenings of the winning films from this year’s Cinema Tropical Awards. Join us from Friday to Sunday to celebrate the best Latin American cinema of the year at the 2019 Cinema Tropical Festival From LGBTQ+ werewolf thrillers to New Jersey grandmothers to contemporary socio-political documentaries to colonial Argentina, there’s something for the entire family. We hope to see you there for this special program! 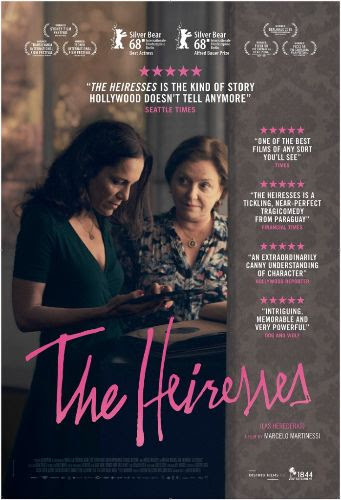 Finally, New York Time‘s Critic’s Pick The Heiresses – “[An] affecting character study, anchored in Brun’s remarkably vivid and nuanced performance” (The New York Times) is playing for two more days at Film Forum. Don’t miss the opportunity to see the critically-acclaimed film that brought Paraguay its first Silver Bears at last year’s Berlin Film Festival. As always, enjoy the film and have a great week! Joaquim Pedro de Andrade is one of the most important Brazilian directors. His filmography, comprised of six features and eight short films, is perhaps the most complete and coherent bridge between 1920’s literary Modernism and Modern Cinema. De Andrade updates in a critical and inventive way the research on Brazilian identity undertaken by the Modernists by inserting the discussion into the context of pop culture, the consumer market, and the behavioral revolution. In 1998, an attempt to do a retrospective to celebrate the ten-year anniversary of Joaquin Pedro de Andrade’s death revealed the precarious state of conservation of his films and the urgency to restore them. The 2003 digital restoration project of his complete works, led by his family, became a milestone in the history of film preservation in Brazil. Perhaps best known for the box office and critical hit Macunaíma (1969), the restoration of The Priest and the Girl (1965), his first feature film based on Carlos Drummond de Andrade’s poem of the same name, prompted a re-assessment of de Andrade’s work by film critics and restated its place in Brazilian cinematography. The screening will be introduced by professor Robert Stam (Cinema Studies, NYU) and Débora Butruce (Ph.D candidate), followed by a discussion.